When we talk about books and stories with our youngest preschoolers, at times we ask them to share what they know. For many children, stories are in books, pictures help tell stories, grownups read books, and children who are 3 “can’t read books or write stories yet”. It does make sense, but unfortunately for some, this feeling that they must rely on adults to access stories can inhibit a child’s capacity to trust in their own ability to develop literacy skills. We want children to “read” the pictures in picture books and tell their own stories. We want them to trust that their scribbles represent important ideas and to value their own writing – whatever it looks like. So what can we do to help validate each child’s personal relationship to words, story, books, drawing and writing? Our approach is to find ways to encourage every child, whatever their development or skill, to “make their mark” and tell their story. This might be a process that includes asking children to “tell about their work”. It might include children describing and labeling their creations, while the adults in their lives write down their ideas, ask questions that can clarify their intentions and celebrate their ideas and successes. It might include getting to know which patterns of lines indicate a child’s signature or other early writing, then celebrating that child’s ability to make a mark that has meaning and that can help us all remember something important. It might mean that adults tell children’s stories, including personal ones, that are not in books but are simply shared orally, and that they encourage children to do the same. It might include adults sharing the joy of well-developed pretend play or a puppet show. And it might include offering children paper in book format so that they can make their own books, write their own words and drawings, and tell friends and family their own stories by “reading” from these personal creations. When children start making books, we talk together about the form of books: where the book starts, the details on the front cover, the title and author. We help children notice that in picture books there is something on every page. We point out that the last page is “The End.” We help children notice that in some picture books there are words and pictures on each page, but in others there are just pictures. And we offer a model for getting started (Is this a ‘once upon a time’ story or does it have facts? ), a model for continuing (What happens next?). Along the way we pose questions that we hope will help children add detail and extend their descriptive language as they tell their story. And then we watch and listen. Unlike other classroom writing experiences like journaling or dictating descriptions of work, teachers don’t write in a child’s book because “each child is the author and they know how the story goes”. 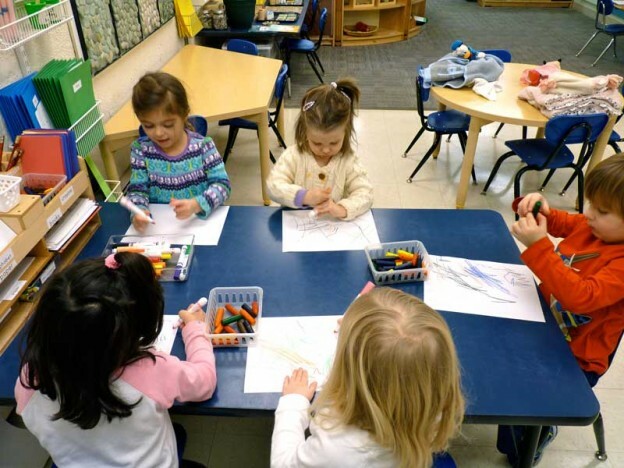 If a child is concerned about the quality of their writing, we encourage them to appreciate that “in the chickadee class, children use chickadee writing” and that their writing will change as they change and grow. When the book is finished, we take a video of the author “reading” the book from beginning to end, supporting the author as the process unfolds. As children make more and more books on their own, their confidence with writing tools, their pretend play, and with picture books grows. We see more children “reading” on their own or with friends at our quiet book times. Puppet shows begin to have dialogue and clear beginnings, middles and ends. Children notice details in picture books more carefully, and retell familiar stories with increasing detail as they take in more clues from the pictures. More children join in the spontaneous word play, rhyming and chanting that occur throughout the day, and more children express a growing interest in letters and words around our classroom. It’s an exciting process to watch unfold! We are in the process of setting up a page for parents of children currently enrolled at LCP on the website (www.learningcirclepreschool.org) so that you’ll be able to see some sample videos of children reading their books (some use names so these stories are in a privacy protected area). We hope you will look for them soon, and appreciate all the learning taking place! This entry was posted in Chickadees, Curriculum, Education, Literacy, Uncategorized and tagged books, chickadee, children, curriculum, education, learning, literacy, preschool on January 28, 2015 by Katrina Selawsky.